How can you retain customers when you don't have what they are looking for? "No, we don't have it," sounds normal. "I am afraid, we've run out of stock. Can I call you back when we get it?" is a better answer. "Oops! Sorry we don't have it right now. You can find it at the store a few blocks away. Let me show you the way," is my kind of answer. 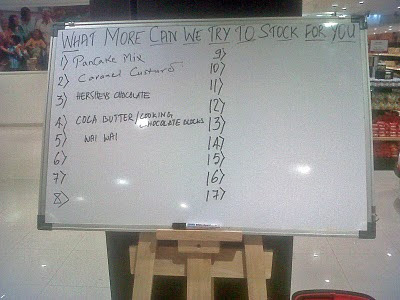 We were at Bangalore Central and this board at foodbazaar shows they care. Good customer service '=' repeat walkins. Can you do this to your business? Service? Why don't you?